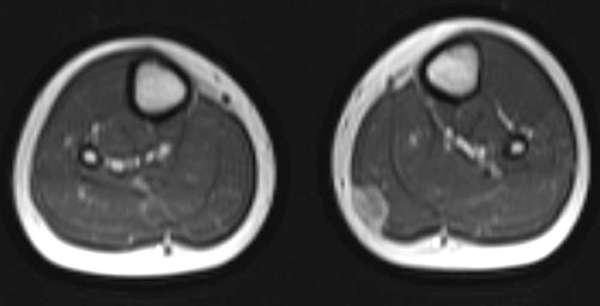 This 11-year-old male had a 3-year history of a slowly growing painless left leg mass, first noticed after trauma. Physical examination revealed a fixed mass in the left leg with no skin changes or ulceration noted. Magnetic resonance imaging (MRI) of the lesion revealed a subfascial well-circumscribed lesion with intramuscular extension in the medial gastrocnemius muscle of the left leg. Clinicoradiological findings could not exclude sarcoma. Excision was performed, and the specimen measured 3×1×0.5 cm. Gross examination showed a multinodular whitish cut surface. 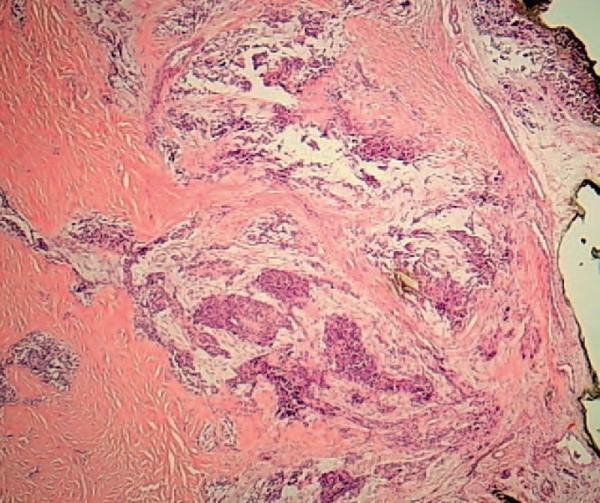 Microscopic examination revealed a moderately cellular tumor with focal infiltration of the surrounding muscle and fatty tissue. On low power, the tumor was characterized by multinodular pattern and extensive sclerosis. Most of the cells were arranged in a reticular pattern and were embedded in the abundant myxoid stroma. 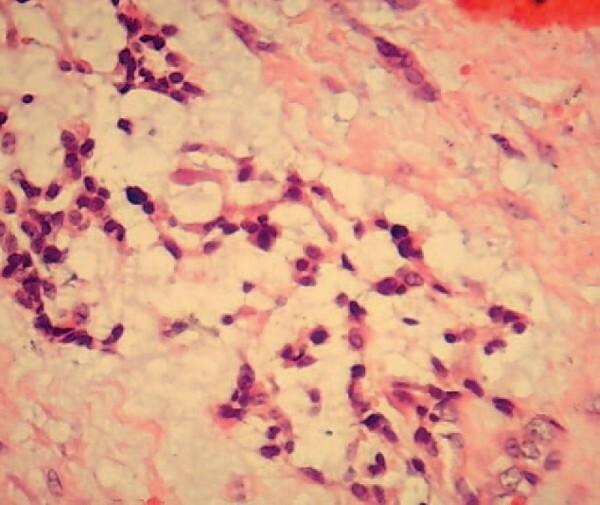 Characteristic small dark nuclei with narrow rim of eosinophilic cytoplasm arranged in strands and cords were observed. Some foci demonstrating round cells with a more primitive appearance and lesser amounts of myxoid matrix were also observed. In addition, cytoplasmic vacuolization of the tumor cells was focally present. 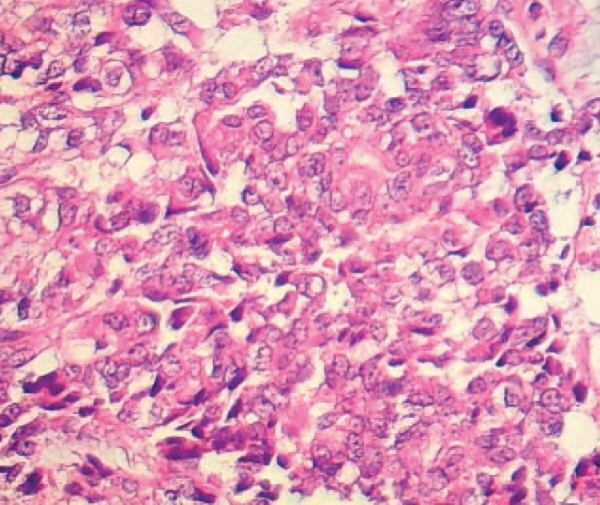 Mitoses were rarely observed, and necrosis was not identified. Immunohistochemical staining for cytokeratin AE1/AE3, epithelial membrane antigen (EMA), desmin, S100, CD99, CD117, INI-1, and Ki67 was performed. The tumor cells were positive for S100. Cytokeratin AE1/AE3 was positive focally in scattered cells. EMA, desmin, CD99, and CD117 were negative. INI-1 protein was retained in the tumor cells, and Ki67 labeling index reached about 10% in some areas. Extraskeletal myxoid chondrosarcoma was the preferred diagnosis. Possible radiotherapy was the further management plan. Informed written consent was obtained from the patient's family for publication of this case report and accompanying images.